Why teach in a Secondary School? Just like with any teaching job, being a secondary school teacher is a highly rewarding and enjoyable job. Not only is every day very different to the next, but you will be working closely with children who are at an age where they are developing their skills and personalities. Not only do you get to watch them grow up, but you get to directly impact on the people they become. What does secondary teaching involve? 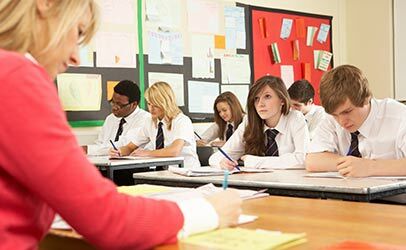 Secondary school teachers work with children between the ages of 11 and 18 and specialise in teaching one or two subjects from the national curriculum. You will be responsible for providing stability, discipline, direction and knowledge to children who come from a variety of backgrounds. The main difference between primary and secondary teaching is that rather than teaching the whole curriculum, you will specialise in your own subject. This means that rather than teaching one specific class all the time, a secondary school teacher will see a range of different class groups throughout the week. Some people prefer the closeness of being a primary school teacher whereas others prefer the variety of being a secondary school teacher. What qualifications are needed for secondary teaching? In order to be a secondary school teacher, a degree is normally required and this should be relevant to the subject that you want to teach. When doing your degree, consider doing a minor in another subject as well as you will be more appealing to schools if you can teach more than one subject. When you’re looking for a new job, it’s very important to make sure that you have a strong and up to date CV. Need some advice to make your CV sing? eTeach has created Regional and School Talent Pools which have been designed to save schools money and to make job hunting easier for candidates. If there’s a particular school or area that you want to work in, simply join that Talent Pool and then the relevant schools will be able to access your CV even if they’re not currently recruiting. Finally, you can keep up to date with the latest job postings on eTeach by signing up to receive job alerts. Simply Register on eTeach and create your own My eTeach account to subscribe to these. This means that you’ll be the first to know when vacancies arise.